Roots rock or so-called Americana groups have been taking a number of forms, from folky, to rock, to bluesy to country-influenced, all marked by a conspicuous absence of the synthesizers, electronic rhythms and the mutant-sounding vocals that seem to be mandatory in commercial pop music. While different combinations of styles are covered by different groups, there are not many in the genre who set out for eclecticism, which almost seems a contradiction to the back-to-the-basics, honest music that roots rock is supposed to be. This week, we have a new recording by a band who put eclecticism right into their name, and tend to live up to the idea. The band is called ESOEBO, which is an acronym for “Eclectic Selection of Everything But Opera.” Their new fourth release is called simply IV. ESOEBO started as a duo and remains mostly that way in performance. Guitarist, singer and songwriter Chuck McDowell and cellist/vocalist Gail Burnett are from the Atlanta area. Back in 2004, they were randomly paired at a church function to play a song together, and they quickly hit it off. McDowell was a big fan of the Beatles at a very young age and decided he had to have a guitar, especially, as their biography says, since the girls were attracted to the guys who played guitar. But he set his music aside mostly for career and family, only occasionally playing for church groups and the like. Ms. Burnett is professional cellist and vocalist with a degree in music, who works as a studio musician and freelancer. She is an advocate of spreading live music for education and entertainment to children. She has a children’s music band called Miss Gail and the Jumpin’ Jam Band. With McDowell and Burnett working together, McDowell started to put more energies into his music and formed ESOEBO as a live group with Burnett doing a wide range of mostly cover material. But McDowell has also been busy with original material, and the duo have created three previous albums. Now with somewhat wider distribution beyond their Georgia base, they are out with IV, and they are joined by a decent sized band with notable guests for the recording, which lives up to its aim to be eclectic in the roots-rock context. It features high quality songwriting and thoroughly tasteful production. The album was produced by Phil Madiera who has been a member of Emmylou Harris’ band. Madeira also serves multi-instrumentalist duties on the album, which also includes Will Kimbrough, who also worked with Emmylou Harris (and is a songwriter in his own right whose music has been recorded by Jimmy Buffett) among others. Chris Donahue is on acoustic and electric bass and Dennis Holt and Bryan Owings alternate on drums. Ms. Burmett’s cello is not heard on every track. The songs were all written or co-written by McDowell, with some collaborations with Madeira. The album lives up to the band’s eclectic aspirations, with the material running from folky to bluesy to country-influenced to jazzy. It’s all very tastefully performed by the first-rate backing band, which who give this album its musical strength. 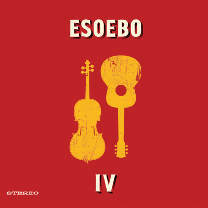 The Georgia duo ESOEBO and their new album IV is a thoroughly enjoyable recording of eclectic roots-rock that spans blues, country, folk and a little jazz. Chuck McDowell’s songs are first rate musically and lyrically, as is the very tasteful production and great playing by the backing musicians. The other half of the duo Gail Burnett plays a less dominant role on the recording. Her cello is heard only occasionally, with her worthy backing vocals being her main contribution to the album. It’s definitely a class act. Our grade for sound quality is close to an “A.” The recording is clean and honest as the music, with no stupid studio stunts. The dynamic range, how well the recording maintains the differences between loud and soft, is not at an audiophile level, but it’s a lot better than many pop albums. Eclectic Selections of Everything But Opera was a name that Chuck McDowell and Gail Burnett probably came up with at the spur of the moment when someone asked them what they played. They have been at it for over a decade now in the Atlanta area. Their new release IV, will hopefully introduce this appealing, intelligent group to wider audiences.